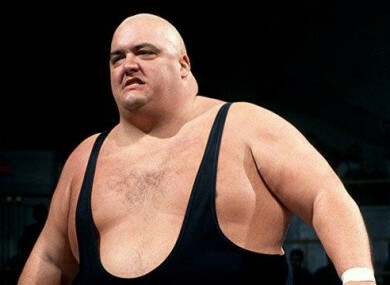 PROFESSIONAL WRESTLING LEGEND King Kong Bundy has died aged 61. The wrestler, whose real name was Christopher Pallies, is well-known for his appearances in the World Wrestling Federation – now WWE – during the 1980s and 90s. He is perhaps best known for wrestling in the main event of Wrestlemania 2, where he fought Hulk Hogan in a steel cage match. Fans reacting to his death recalled Bundy as an “icon” and a “hero”. In a tribute to Bundy on its website, WWE said he stood at an impressive 6’4″ and weighed 456 pounds. “The sight of Bundy stepping between the ropes was intimidating enough, but his crushing offense proved that he was every bit as destructive as advertised,” it said. WWE extends its condolences to Bundy’s family, friends and fans. Other legends of the industry paid tribute to Bundy, with Hogan saying he was “overwhelmed” by his passing. Wrestler and senior management figure at WWE Triple H said he was “saddened” to hear of Bundy’s death and called him a “fan favourite”, while Mick Foley said “he was so cool to me when I walked in that @WWE dressing room as an absolute nobody in 1986″. Bundy had been part of a lawsuit against WWE initiated by a number of former wrestlers which alleged the company hadn’t taken adequate measures to protect them against brain injuries. This lawsuit was dismissed last year. Email “Wrestling legend King Kong Bundy dies aged 61”. Feedback on “Wrestling legend King Kong Bundy dies aged 61”.